Unwanted hair can show up anywhere: on our faces, backs, legs, etc. Rather than waxing or shaving, which can be messy and/or painful, laser hair removal is a much more convenient way to remove unwanted hair. Laser hair removal has become the gold standard for removal of unwanted facial and body hair. At The Dermatology Center our providers are trained in the top techniques to remove unwelcome hair using the best treatments available. Laser devices send concentrated beams of light into a treated area, which is absorbed by the melanin (dark) pigment that is present in hair follicles. Hair grows in cycles, so a series of treatments is needed to help permanently destroy the hair follicle. Unfortunately, laser is unable able to target hair that lacks dark pigmentation, such as red, blonde, white, or gray. How many sessions will I need for hair removal? Most people need a series of six or more treatments for permanent hair growth reduction. At TDC, we do everything possible, including the use of numbing creams, to make a laser hair removal treatment as pain-free as possible. 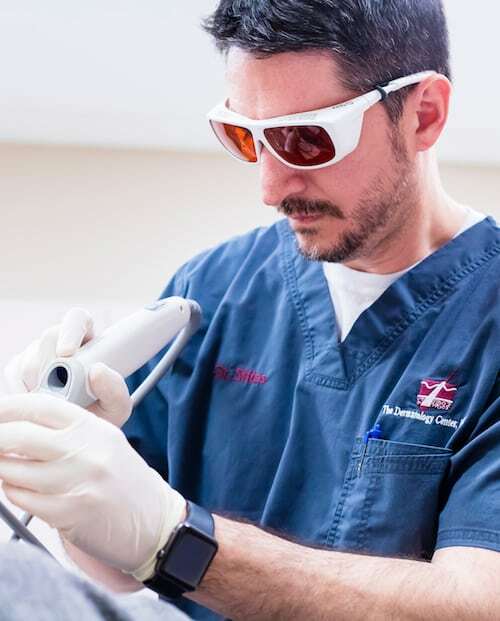 Laser hair removal treatments slow down hair growth, cutting down the need for expensive razors, shaving cream, self-waxing kits for upper lips and chins or beauty appointments. What’s more, laser hair removal offers most people a permanent solution for unwanted hair, making it possible for people to ultimately save money and time in the long run once they’ve undergone complete treatment. Laser technology for hair removal offers permanent reduction for most people after they have completed the necessary series of treatments. For some people, maintenance sessions are needed, but the hair regrowth that is experienced is much less than before. Laser hair removal is non-invasive with less pain than can be typically experienced with a waxing treatment. The sensation of laser hair removal is often equated with a small pinch, but since the entire process is so quick, the pain resolves quickly. We now have extended hours to better meet our patient’s needs!